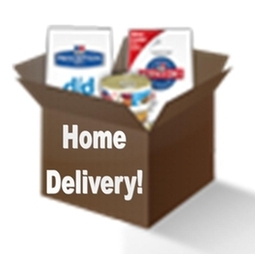 We are happy to offer home delivery for the majority of your pet's food, medications and supply needs. Our home delivery service, VetSource is a division of the same top-quality veterinary distributor from which we order the majority of our hospital supplies. All of the products are guaranteed by their manufacturer. Click on the Home Delivery box on our home page, or click here VetSource, to access our home delivery service.